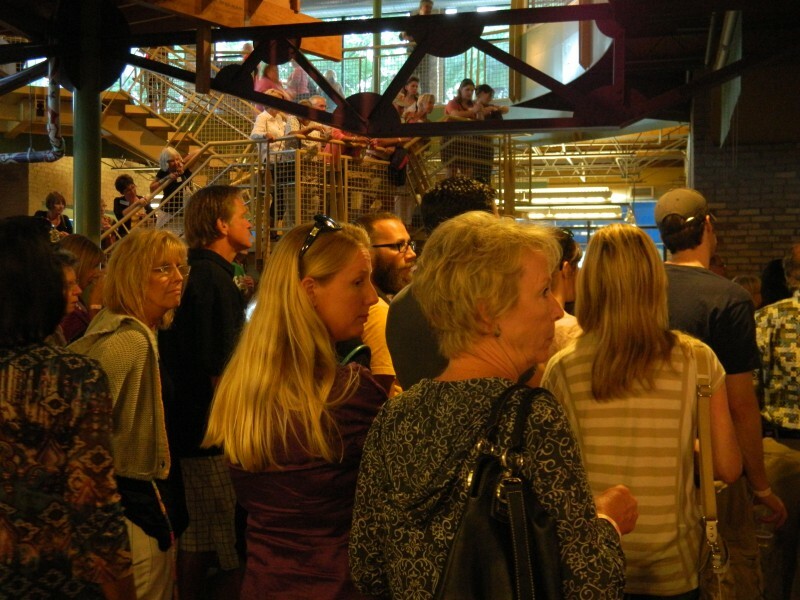 ArtPrize kicks off the 2011 season with an event that honors volunteers. Imagine that you have decided to become more involved in your community. 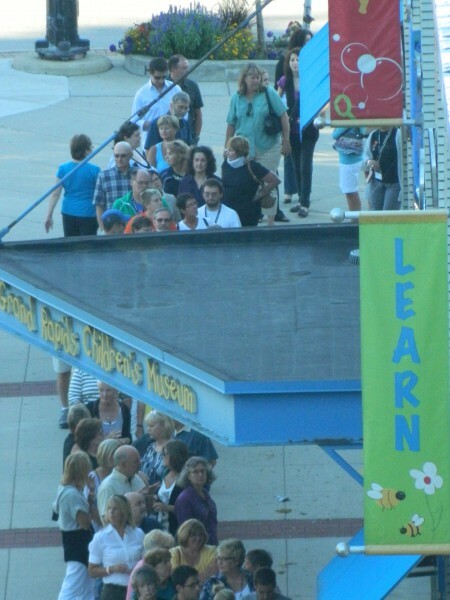 Imagine that ArtPrize is the event that you settle on as the object of your altruistic work. What sort of experience welcomes a volunteer for this local art extravaganza? Great food and entertainment, an opportunity to meet with volunteers of all ages and glimpses from staffers of what is to come during this popular event all were part of the Volunteer Kick-off Party at The Grand Rapids Children's Museum on August 10, 2011. Those who arrived for the Kick-off queued up well before the 7:00 pm start time. Volunteer Jana Hanson lives near the museum and came because she "wants to show people how wonderful it is downtown." She volunteers for a number of community events and organizations, and she enjoyed the ArtPrize volunteer experience enough in the past to return again for the current season. When the doors to the invitation-only event opened, 426 or so involved citizens mingled with other volunteers, were welcomed by ArtPrize staff and were treated to snacks, beer and wine by Ninth Bridge Market of Ada and entertainment by Evenstephens of Greenville. Karaoke kept the crowd gathered on the main floor and at the rails up above on the second floor. Rick DeVos, founder of ArtPrize and Todd Herring, Director of Marketing, each took a turn at the microphone. "Every time we interact with the public it's exciting. It never gets old," Herring said after his performance produced cheering and applause from the crowd. 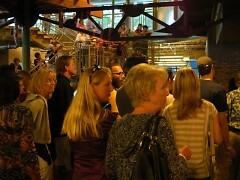 Many ArtPrize staff members attended the kick-off event. Staffers were eager to talk to others about the changes that are in store this year. David Abbott, Development Director, let this reporter in on a few of the new items that will be available to event-goers, including a line of clothing inspired by the #3, in honor of ArtPrize's junior year. "Everybody embraces ArtPrize so much they want to walk away satisfied, with a piece of it," noted Abbott. Another topic of conversation with Abbott was the new community partnerships that have developed, including one with Mary Ann's Chocolates of East Grand Rapids; he described a line of edible souvenirs themed to Grand Rapids neighborhoods including such chocolatey cleverness as the Hillside, made with dark chocolate, sunflower seeds and cranberries, a confection honoring healthful antioxidants, giving the nod to the many medical venues in the neighborhood. Executive Director, Catherine Creamer, and Public Relations Director, Brian Burch, were pleased that so many people turned out for the event. One of those who turned out in years past was Creamer herself. While volunteering at ArtPrize may not result in future employment, the Kick-off Party bodes well for volunteers' future enjoyment.